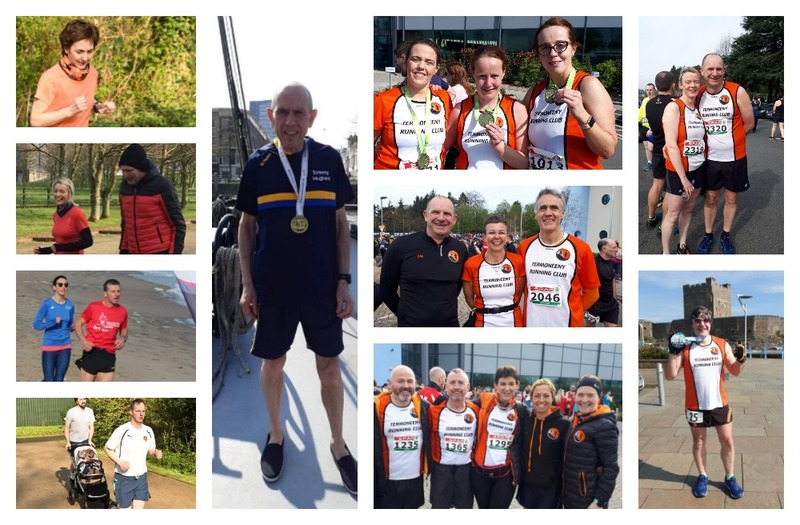 What a fantastic weekend it was for Termoneeny Running Club. First up was James McNally who took part in the first of the EAMS FATLAD series at Carrickfergus Castle. This was James’ 35th Marathon which he completed in 4 hours and 45 minutes. Congratulations James, great to see you back out notching up yet another 26.2 miles! It was a perfect day for the SPAR Omagh Half Marathon on Saturday. Now in its 30th year, the Omagh Half Marathon & Fun Run started off as a 10 mile race in 1981. In 1986 it was a 12 mile race but changed to Half Marathon distance in 1987. What was once a hilly course was rerouted to become an undulating route which attracts thousands of runners each year. There was a great turnout from Termoneeny with super performances from everyone who took part, particularly given the unexpected warm weather! Our first runner home was Helena Quinn in a very impressive 1:33:22, followed closely by Michael Burke in an equally impressive time of just 1:34:40. Congratulations to everyone who took part , with so many achieving PB times. Thanks to Omagh Harriers for a fantastic event and their outstanding hospitality! Full results are as follows: Helena Quinn 1:33:22, Michael Burke 1:34:40, Shane Hurrell 1:35:25, Kevin Darragh 1:39:39, Eamonn Melaugh 1:40:26 PB, Orla Hatt 1:40:19 PB, Damien O’Boyle 1:41:46 PB, Shauna Melaugh 1:43:00 PB, Robbie Maguire 1:44:52, Kerry Evans 1:50:34, Michelle Comer 1:52:27 PB, Catriona Murphy 1:52:22, Christina McErlean 1:53:17, Oonagh Madden 2:08:52, Tara Montgomery 2:24:41, Jacqueline McGonigle 3:00:27. Congratulations to Claire Hassan who, along with her father Seamus, took part in her 54th Parkrun at MUSA in 36:49 – well done Claire, it’s great to see you out running again! Thomas Doherty took to the soft and tricky sands of Portrush Parkrun on Saturday morning finishing in 22:39 and in an impressive 6th place – well done Thomas! Congratulations Kevin McErlean on his Parkrun PB at Antrim Parkrun! Kevin finished in a super time of 26:00! Also joining in the Antrim Park run were Lindsay Gibson (28:29) Ann McGarvey (32:02) and Anne Breen (33:12). Fantastic running ladies, keep up the great work! The Termoneeny 5/10k 2019 will take place this year on the evening of Friday 10th May and registration is now open. All online entries will be entered into a raffle to win a Garmin Forerunner 35! See our Facebook page and website for details. ⇐ It’s a Leung way from Dublin to Belfast!